Akamai constantly monitors the SIEM event stream, looking for Identity Cloud-related activities such as logins, registrations, password changes, etc. Each time one of these events occurs (for example, each time a user successfully logs in) information about the event (who logged on, when they logged on, where they logged, etc.) is recorded. Alternatively, organizations can have event information delivered at regularly-scheduled intervals. For example, an organization might decide to receive SIEM events every 10 minutes. In that case, all the Akamai-related events that occur in the next 10 minutes are stored in an SFTP server queue. When the 10 minutes are up, those events are delivered, the queue is cleared, and SIEM Integration begins storing the next batch of events. Events are received by the customer. The exact mechanism for event receipt will vary depending on both the delivery method (webhook or batch) and on the organization’s SIEM software. Real-time event delivery (webhooks) usually involves an API server, a message queue, or an HTTP server. Batch delivery (scheduled delivery) typically relies on an SFTP server or a file receiver. Organizations will work with their Akamai representative to determine their optimal delivery method. Events are imported into your SIEM software and analyzed. Organizations use the data in the way that works best for them: for example, you determine the things you want to look for, you determine what does and does not represent anomalous behavior, and you determine what triggers an alert and what does not. 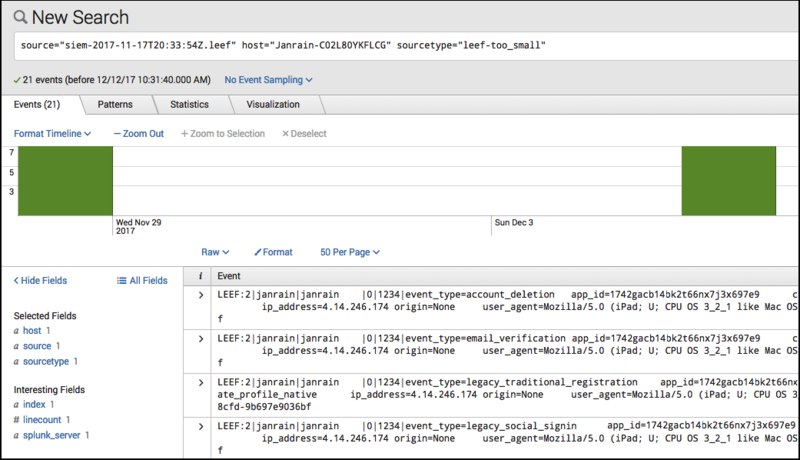 Akamai SIEM Integration supports two standard SIEM file formats: the Common Event Format (CEF) and the Log Event Extended Format (LEEF). Data can be retrieved in near real-time by using webhooks, or can be scheduled for regular deliveries using a secure FTP (SFTP) server. Depending on your needs and on your SIEM platform, Akamai SIEM integration can use various delivery mechanisms such as message queues, APIs, HTTP receivers, or file receivers.